Postal, Insurance and other state level recruitment examinations like TSPSC,APPSC etc. This section consists of questions on Current Affairs updates and General Knowledge (G.K.). 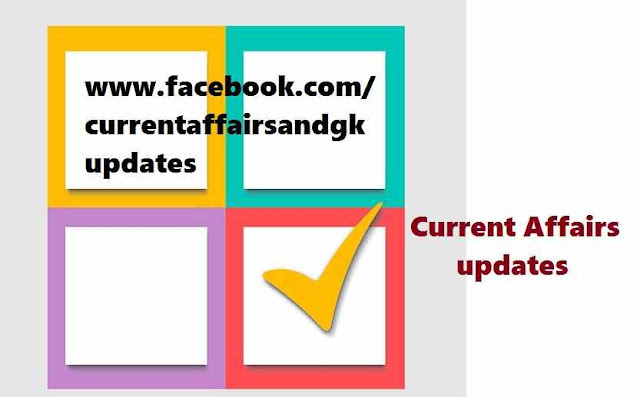 Updates till 23rd October 2015 are given below. 1.Actor Nasser and Vishal were declared winners of Nadigar Sangam elections and will assume the posts of President and General Secretary respectively. 2.The Nadigar Sangam was formed in 1952 by MGR,Sivaji Ganeshan,M.R.Radha and few others. 3.Chennai Super Kings and Rajasthan Royals were suspended from IPL (Indian Premier League) for two years for the betting activities till 2018. 5.London's Big Ben has been striking the hour for 156 years.But it slipped out a whole six seconds last summer. 6.Former Indian opener Virender Sehwag has announced his retirement from International Cricket and the IPL (Indian Premier League) on his 37th Birthday.He will continue to play first class cricket. 7.Virender Sehwag represented Kings XI Punjab and Delhi Daredevils teams in IPL (Indian Premier League). 8.Prime Minister Narendra Modi laid foundation stone for Andhra Pradesh's new capital Amaravati at Foundation laying Ceremony at Uddandarayunipalem in Guntur District(Andhra Pradesh). 9.Justin Tradeau is elected as the Prime Minister of Canada. He is leading the Libert Party in Canada.